You are currently browsing the tag archive for the ‘Medieval’ tag. Did you grow up playing adventure games and reading fantasy literature (a la “Dragonlance”, “Lord of the Rings”, and “Harry Potter”)? Well if so, you are familiar with a standardized stable of fantasy creatures from medieval lore–familiar mythical beasts such as Manticores, griffins, dragons, and trolls. The creatures which didn’t come from classical mythology originated in bestiaries–medieval fieldguides of astonishing creatures. These treatises didn’t just have made-up monsters they also had a moralizing flavor…and hopefully some illustrations! However there were some beasts in the bestiaries that didn’t make it past the red pencil of Tolkien and Gygax–like the unhappy subject of today’s post, the bonnacon. The Bonnacon comes down to us from no less a source than Pliny the Elder (who thought it lived in Paeonia (which is modern Macedonia/Bulgaria). The bonnacon was the comic relief monster in medieval bestiaries. The medieval manuscript writers loved it because of its scatalogical hijinks, however the mythical animal’s means of defending itself was so uncouth that the prim myth-makers of the present left it out of the worlds which they built. I will leave it to the Aberdeen Bestiary to describe the creature to you in its own words. I have stolen the translation from Wikipedia, but the page is immediately above this paragraph, if you want to translate the Latin yourself. In Asia an animal is found which men call bonnacon. It has the head of a bull, and thereafter its whole body is of the size of a bull’s with the maned neck of a horse. Its horns are convoluted, curling back on themselves in such a way that if anyone comes up against it, he is not harmed. But the protection which its forehead denies this monster is furnished by its bowels. For when it turns to flee, it discharges fumes from the excrement of its belly over a distance of three acres, the heat of which sets fire to anything it touches. In this way, it drives off its pursuers with its harmful excrement. The poor bonnacon thus seems like a beast which ate too much spicy Taco Bell. This was obviously a source of much glee to the illuminators and scribes of yore, but it was too much for J.K. Rowling. Even fantasy beasts have to get with the times and so the bonnacon has been left behind in the dark ages. Even if it didn’t make it into adventure books and golden tales of magical enchantment, I wonder if there isn’t a place for the monster in contemporary music or modern stand-up. This thing might fit right into Andrew Dice Clay’s act and who can doubt that it would naturalize instantly into Eminem’s lyrics. I wanted to share with you a glimpse back into history to one of the most peculiar and specialized cities of western history. During the middle ages, monasticism was a vast and powerful cultural force. Indeed, in certain times and places, it may have been the principal cultural force in a world which was painfully transforming from the slave society of classical antiquity into the modern kingdom states of Europe. West of the Alps, the great monastic order was the Benedictine order, founded by Saint Benedict of Nursia, a Roman nobleman who lived during the middle of the 6th century. “The Rule of Saint Benedict” weds classical Roman ideals of reason, order, balance, and moderation, with Judeo-Christian ideals of devotion, piety, and transcendence. 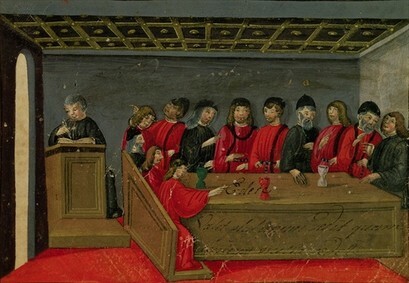 The Benedictine Order kept art, literature, philosophy, and science (such as it was) alive during the upheavals of Late Antiquity and the “Dark Ages”–the brothers (and sisters) were the keepers of the knowledge gleaned by Rome and Greece. The monks also amassed enormous, wealth and power in Feudal European society. The greatest abbots were equivalent to feudal lords and princes commanding enormous tracts of land and great estates of serfs. Nowhere was this more true than in Cluny, in east central France (near the Swiss Alps), where Duke William I of Aquitaine founded a monastic order with such extensive lands and such a generous charter that it grew beyond the scope of all other such communities in France, Germany, northern Europe, and the British Isles. The Duke stipulated that the abbot of the monastery was beholden to no earthly authority save for that of the pope (and there were even rules concerning the extent of papal authority over the abbey), so the monks were free to choose their own leader instead of having crooked 2nd sons of noblemen fobbed off on them. Additionally, the monastery created a system of “franchise monasteries” called priories which reported to the authority of the main abbot and paid tithes to Cluny. This wealth allowed Cluny to become a veritable city of prayer. The building, farming, and lay work was completed by serfs and retainers, while the brothers devoted themselves to prayer, art, scholarship, and otherworldly pursuits…and also to politics, statecraft, administration, feasting, and very worldly pursuits (since the community became incredibly ric)h. The chandeliers, sacred chalices, and monstrances were made of gold and jewels, and the brothers wore habits of finest cloth (and even silk). The main tower of the Basilica towered to an amazing 200 meters (656 feet of height) and the abbey was the largest building in Europe until the enlargement of St. Peter’s Basilica in the 17th century. At its zenith in the 11th and 12th century, the monastery was home to 10,000 monks. The abbots of Cluny were as powerful as kings (they kept a great townhouse in Paris), and four abbots later became popes. At the top of the page I have included a magnificent painting by the great urban reconstruction artist, Jean-Claude Golvin, who painstakingly reconstructs vanished and destroyed cities of the past as computer models and then as sumptuous paintings. Just look at the scope of the (3rd and greatest) monastery and the buildings around it. Such wealth also engendered decadence and corruption. Later abbots were greedy and incompetent. They oppressed the farmers and craftspeople who worked for them and tried to cheat the merchants and bankers they did business with. The monastery fell into a long period of decline which ended (along with the ancien regime, about which similar things could be said) during the French Revolution. Most of the monastery was burnt to the ground and only a secondary bell tower and hall remain. Fortunately the greatest treasures of Cluny, the manuscripts of the ancient and the medieval world, were copied and disseminated. The most precious became the centerpiece of the Bibliothèque nationale de France at Paris, and the British Museum also holds 60 or so ancient charters (because they are good at getting their hands on stuff like that). We can still imagine what it must have been like to live in the complex during the high middle ages, though, as part of a huge university-like community of prayer, thought, and beauty. it was a world of profound lonely discipline tempered with fine dining, art, and general good living–an vanished yet eternal city of French Monastic life. Today, through the magic of the internet, Ferrebeekeeper is visiting a graveyard halfway around the world in Armenia (alas, I am visiting through words and images only; as always, my body remains stubbornly in New York City shackled to an office chair and a bunch of elusive dreams). This exquisite spot is Noratus Cemetery, beside Lake Sevan, in eastern Armenia, not far from the Azerbaijan border. This region has been a crossroads for people for millennia. Although Noratus is today a small village, during the Middle Ages it was a large prosperous town. A bronze-aged hillfort stands nearby. Prehistoric travelers passed through this region on humankind’s great migrations, and the region is not far from the first palace civilizations of the ancient world. Persians, Greeks, Romans, mysterious steppe peoples of all sorts, Turks, Mongols, Russians, caravan folk from east and west, Chinese, Soviets, and contemporary world travelers have all passed through the region. However, this post is not a history of Armenia (thank goodness: I could never begin to explain the beautiful tangled chronicle of that crossroad nation): we are talking about Noratus Cemetery. The oldest stones in the complex date back to the 10th century, but the cemetery has been utilized off-and-on right up to the present. The most famous stones of Noratus are the khachkars—the cross stones. These are intricately carved stele with Christian crosses carved upon them in syncretic Asian styles. Once upon a time (by which I mean, in the nineteen nineties), the greatest concentration of ancient khachkars was in the Armenian cemetery in Julfa (in Azerbaijan), but the Azerbaijan government destroyed these beautiful ancient works in order to further some self-aggrandizing lie or another, so today, the largest concentration of medieval khachkars is in…Noratus cemetery. You can see here how the maelstrom of cultures has influenced khachkar makers from over the centuries. The mysterious gravestones look, by turns, Scythian, Romanesque, Persian, Indian, and even Jewish: yet they are none of these styles (although they are influenced by each)—they are Armenian. But beyond the ancient exquisite graves, and the Romanesque chapels, look at the mountains and the lake beyond. I have stolen these pictures from around the internet so I don’t really know what is in each (apparently the cemetery is easy to visit (if you are in the hinterlands of eastern Armenia) but badly labeled so it might take some specialists in Eastern medieval art to unravel the meanings and eras of these stones anyway, but their artistic excellence and spiritual splendor is readily evident. We are coming up to Halloween time and Ferrebeekeeper always features a special theme week to celebrate the spooky season. Start getting ready for next week’s dark excitement! For today though I want to present a half-spooky, half-beautiful Gothic post (since it has been too long since we visited that category). One of my favorite things are fountains—the aesthetic (and, usually, the actual) focal point of gardens and town squares. Fountains represent vitality, comfort, and healing—they are the place where people go to quench their spiritual thirst (and, you know, get water). The most famous fountains tend to be in Baroque, modern, and Greco-Roman styles, but there are also many lovely Gothic fountains throughout Europe. Some of these are almost wholly religious in character, but others are spidery and ornate or feature dragons, monster, and gargoyles. Here is a little gallery of random Gothic fountains. Most of them are real, but it seems like a couple may have been built by computer programmers to enliven online worlds of magic and fantasy. They are all exciting and interesting and they provide an early taste of Halloween fun (and hopefully quench your need for Gothic hydration). This is the Essen crown. A magnificent crown of gold (alloyed with silver) carved and/or cabochon jewels and natural pearls. It is the oldest surviving lily-formed crown and it has been in the possession of the Essen Cathedral/monastery practically forever. Despite its great beauty and obvious historical interest, I have not written about it because we don’t actually know much about it and because its long existence has been somewhat dull. During the early 20th century scholars speculated that it was the childhood crown of Holy Roman Emperor Otto III, a scion of the Ottonian line which ruled the Holy Roman Empire after the famous Carolingians. The story runs that young Otto gifted the crown to Essen at the end of the 10th century (ca 999 AD) where it was fitted upon the brow of a statue of the Virgin. Modern scholarship and careful analysis by historically-minded jewelsmiths have cast doubt on this theory, however, and now it is believed that the crown was made in the early 11th century specifically as a votive crown for the statue of the Virgin. Since it did not represent worldly power (and since it was well-guarded) it passed long uneventful centuries there without lots of murders, thefts, or possession by Jimmy Carter. Even if the history is somewhat dull, the crown is certainly not. It is very lovely to look at and represents an apogee of Saxon goldworking. I hope its appearance (or otherworldly ancient power) moves you even if its story of sitting around a church for 900 years is not necessarily so exciting. At Ferrebeekeeper we have featured all sorts of Gothic things: Gothic beds, Gothic clocks, Visigoths, and Gothic cathedrals. Here is “El puente romano” of Cangas de Onís (a town in Asturias in Northwest Spain). Although the bridge, which crosses the Sella River is known as “the Roman Bridge,” its name is a misnomer. The stone structure was probably constructed at the end of the 13th century. Stylistically it is a transition from late Romanesque towards Gothic (although I guess a stickler for bridge architecture would probably classify it as Romanesque). The two large arches on either side of the cambered central arch are of different sizes. It is certainly an exceedingly beautiful structure: I would love to walk across it…if I am ever sojourning in Northwest Spain. The Ming Dynasty was a hereditary dynastic empire which ruled China for 276 years between 1368 AD and 1644 AD. This regime was lumbered with an exceedingly conservative and cautious weltanschauung, which caused Ming leaders to walk back some of the empire’s greatest accomplishments (like astonishing journeys of discovery and prodigious economic growth—both of which were nipped in the bud). Arguably this unbending Confucianism ultimately led to the downfall of the Ming as well (although the dynasty was undoubtedly undone by wide a host of factors). However this same core traditionalism also made the Ming dynasty one of the longest and most stable empires in world history. The Ming dynasty achieved a number of cultural and social high watermarks which were not exceeded anywhere for a very long time. I was hired by a national magazine to write a little biography of the founder of the Ming dynasty, Zhu Yuanzhang, the Hongwu Emperor, whose meteoric rise from penniless beggar to the most powerful man on Earth is scarcely comprehensible. Indeed… Zhu’s history apparently really wasn’t comprehensible to the editors of the magazine, who never published my piece (although they certainly delighted in making me rewrite it and then editing it into incoherence). Naturally, I blame this failure almost entirely on the ignorance, cupidity, and general moral failings of these self-same editors. However, in their defense, Chinese history is a baffling maelstrom of horrifying wars, subtle political machinations, and names which are transliterated differently into English in different sources (not to mention the lives of countless millions and millions and millions of people). It is difficult to make any sense of any of it without knowing Chinese, an ancient exquisitely beautiful language of perfectly baffling tonal sounds and thousands of impossible-to-memorize logograms. All of which is to say, this biography is now mine and I am going to publish it here this week as the centerpiece of Ferrebeekeeper’s “Ming Dynasty Week” a celebration of the art, literature, and history of one of my absolute favorite eras. This will include a special look at the famous ceramics which are synonymous with the period as well an examination of some of the less-well-known but equally dazzling highlights of this amazing time. Get ready to learn about all sorts of Ming things. This week is going to be great! Here is a mid 14th century crown which was “found in Hungary” (if there are exquisite gold and ruby medieval crowns just lying around there, perhaps I am in the wrong place). The crown was probably made by French jewelers who, then as now, were among the best in the world. The crown consists of eight ornamental lily segments held together by hinges (pinned with twining vine-leaf ornaments). The internet feels that this is the crown of Elizabeth Kotromanic of Bosnia. Elizabeth was a classic “Game of Thrones” style noblewoman who wedded King Louis I of Hungary and then also became Queen of Poland when Louis’ uncle died. Initially a powerless consort, she surrounded herself with ambitious nobles and worked her way into such a position that, upon her husband’s death, she became the queen regent of Poland, Hungary, and Croatia (and de-facto ruler of southern Italy, Bosnia, Serbia, Wallachia, and Moldavia!). Alas, Elizabeth was good at pitting nobles against each other, but she failed to rule well or carefully and she was captured and strangled by her many enemies. This crown was seemingly donated in her name to the shrine of St. Simeon shrine in Zadar (so it wasn’t exactly lying in a truck stop bathroom or a forest glade, like I made it sound in the first sentence). Whether this crown was hers or not, it is certainly a winsome and beautiful piece, but, like all crowns, it looks a little cursed to me. Maybe it is better if Saint Simeon hangs on to it. Ok, I apologize for this week. A friend of mine generously agreed to teach me 3D computer assisted design on Thursday, and I had a cold last night and just fell asleep after work–so there were only a measly 3 posts this week! To make up for it, I will put up this week’s sketches tomorrow in a special Sunday post—so tune in then (and bring all of your friends and loved ones too!) but first, here is a rare Saturday post–a weird jeremiad about guilds. “Guilds” you are saying,” didn’t those die off in the middle ages? We live in a glistening modern world of opportunities now!” Actually, guilds didn’t die at all—they have morphed and proliferated in ways both beneficial and detrimental to society. We should think seriously about this and ask whether the ambiguous benefits of guild outweigh their unfair anti-competitive nature. 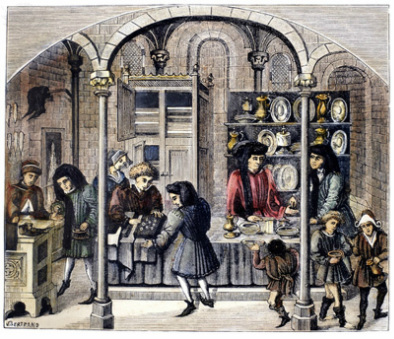 First let’s quickly go back to the Middle Ages when there were two competing ways of learning professional trades. You could go to a guild, where weird old men made you do sit on a bench and do menial tasks for twenty years while you competed in pointless status games with your cruel peers (and underwent fearsome hazing). Assuming you survived all of this, you became part of the guild, and participated in its quasi-monopoly on trading fish with the Baltic, making oakum ropes, scrivening, alchemy, accounting, or whatever. Savvy readers will see the roots of the AMA, the Bar Association, and even our great universities and trade schools (and maybe our secondary schools) in this model. The other way was the master/apprentice system. This is now most familiar to us through wizards, kung fu warriors, artists, Jedi, and other fictional characters—which is to say it has not proliferated in the modern world. A wise master would take a favorite student under his/her wing and teach them the ropes. 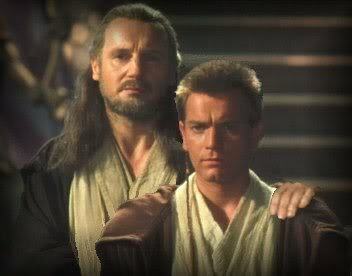 This system had the advantage of being better and faster than the guild system—it can truly foster rare genius– but it had all of the Jesus/Peter, Jedi/Sith, father/son problems familiar to us through fiction. 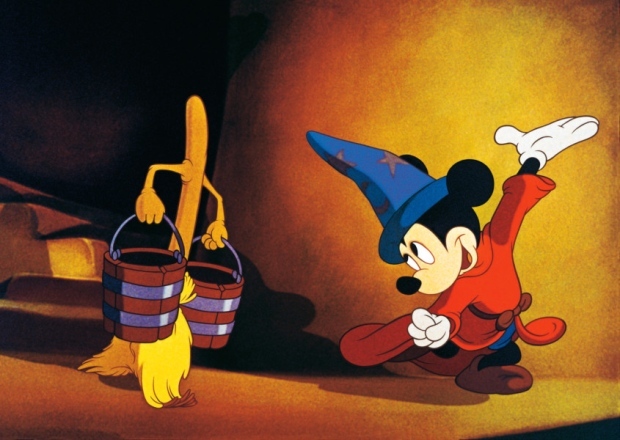 Namely the master frequently held on too long, became evil, started giving sermons in the wilderness, or otherwise went bad: or the apprentice decided they did not want to wait but were ready to paint naked ladies instead of mixing paint…or to enchant brooms or to fight the howling serpent gang. During the nineteenth century, law and medicine were learned like gunsmithing, coopering, and hat-making: through apprentices. It worked fine for law but not for medicine (although I am not sure 19th century medicine was worthwhile anyway). Today we have universities and professional schools controlling all the ways upward in society (provided you have adequate money and have passed through endless mandarin-style standardized tests). It is making society sclerotic. Anybody who has spent time in a contemporary office will instantly recognize the parochial narrow-minded professional mindset encountered at every turn. We have a society made up of narrowly educated reactionaries monopolizing each profession. Time to open things up a bit with a different model. The apprentice system worked well in the past. Let’s try it again (and get rid of these smug gate-keeping professional schools in the process). Nothing could go wrong here! Frankly I suspect that Doctors alone should have guilds. It is the only discipline important enough and complicated enough to warrant the stranglehold protectionism of a professional association. The great medical associations make use of master/apprentice-style relationships later on in a doctor’s training anyway, and they have proven themselves responsible guardians of their sacred trust in numerous other ways. Lawyers, florists, morticians, artists, clowns, accountants, underwater welders, actuaries and other dodgy modern professionals should compete through the open market. If you want to be a businessman find a businessman and train with him until you know enough to defeat him in open business combat. If you want to be a florist or a computer programmer, find a master florist or a master programmer. Disciplines like geology and engineering could keep pseudoscientists and frauds out of their ranks with continuing brutal tests. Of course it is possible that this whole post is merely an angry reaction to troubles in my own extremely subjective profession, art. Contemporary art schools are thoroughly worthless in every way. Back during the 50s and 60s, a bunch of doofy political theorists took over and hijacked art (which has many unpleasant similarities to political theory…but which is not political theory). Art has been a meaningless game of celebrity and identity-politics ever since. It is sadly devoid of the master craftsman aspect which once made it great. I didn’t learn art at a famous art school. I learned from a great master painter…who went a bit bonkers and moved off to China to practice veganism and sit on a mountain. That is the way things should be! This business of going to Yale or RISDI needs to be thrown on history’s scrapheap. Purpureus is a Latin word which came directly into English in the 14th century (although not a lot of English speakers say it as an adjective these days). In Latin it means “brilliant, radiant shining” or “wearing purple” or it describes the color royal purple or red. In English it just means purple! The Latin word itself was borrowed from ancient Greek world “porphyritica” which describes the kingly purple of Tyrian purple or porphyry (a deep red igneous stone of extreme hardness which could, with much labor, be made into costly sculpture). All of which is to say purpureus is still on the books as a color—a middle range purple almost half way between red and blue (although maybe leaning slightly toward red). The hue is somewhat paler than true purple, but it is still a very regal color. Naturalists have long used the word to describe purple creatures. 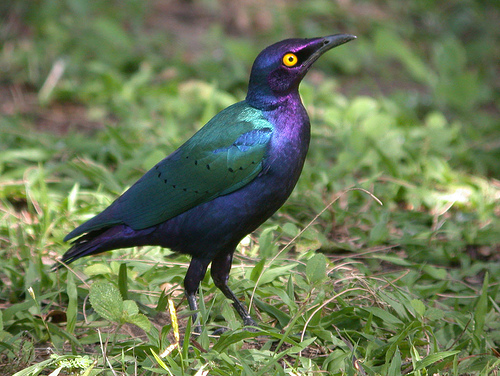 For example here is a magnificent Lamprotornis purpureus—a purple starling, which makes its home throughout tropical central Africa.